Marilyn Monroe Mural @ Ipoh, Malaysia - Always Travelicious ! Yesterday I was at Burps & Giggles for brunch and had a bit of fun with the whimsical Marilyn Monroe mural just outside. It’s on the little lane that’s next to Burps & Giggles so don’t miss it! If you are seeing this picture for the first time, the mural may seem awfully realistic and popping out to life because indeed part of the mural IS popping out – look again – half of the bicycle is real while the other is within the painting! The stick that the kids use to lift up Marilyn’s skirt is popping out too! 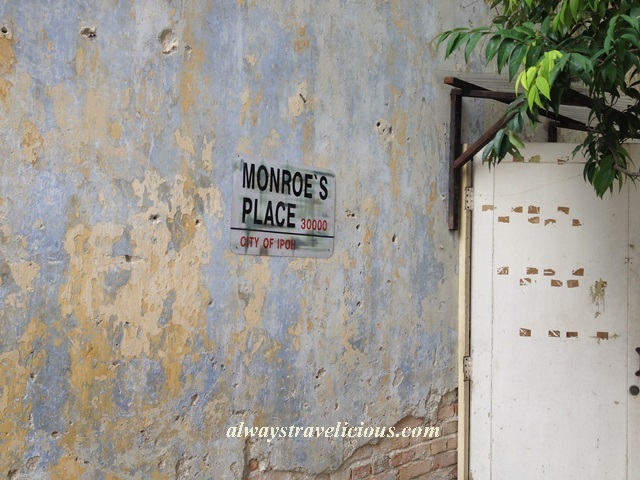 The lane is aptly named “Monroe’s Place”, in the City of Ipoh 30,000, a nostalgic lane peeling apart with patches of remnant colors. another Marilyn Monroe with the front part of the bicycle in the newly opened Buku Tiga Lima adjacent to Burps & Giggles. My favorite one is still the one at Monroe’s place with the kids – I think that has captured the essence of Marilyn Monroe’s sexiness. When is the last time you went on a swing? Just one shop lot away, there’s one more mural by the same artist Kareem. I think the two ladies are salt farming? Anyway, here is what I ate for brunch – smoked chicken sandwich, with chunky Japanese cucumber and egg (RM16). Was stuffed! Operating Hours – 8am – 8pm. Closed on Tuesdays. (But the mural is always there 24 hours as it’s outside). Pingback: Ipoh Murals @ Malaysia | Always Travelicious ! I think the two ladies are tin mining (streaming) – the manual way. The lady on the left is digging some material into her round wooden dulang. The lady on the right is bending down to swirl her dulang with some added water just on the water surface. The lighter sand will be swirled out leaving grains of the desired heavier tin ore in the dulang. The same manual method is used for both tin and gold mining – but called panning by the westerners, and dulang washing in Malaya. The headscarf, big hat, long sleeves and long pants are the normal wear for this sort of tin-mining activity in the blazing sun and standing in the reflecting water. This activity was common in the old days.